Weekend Two ACLgoers always have a bit of an advantage, having had the chance to hear about some of the favorite sets from the first weekend. We had a sun-filled and fun-filled Weekend One. As always, we wish we could have been more than one place at a time on more than a few occasions, and inevitably, there is a band or two that gets missed in favor of getting some much-needed food, taking a restroom break or simply because you just need to sit down for a little bit. 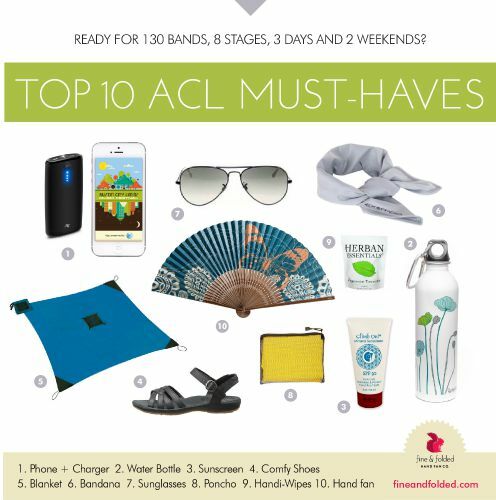 Check out our What To Wear And What to Bring To ACL article for our advice before you head out. During Weekend One, I ended up in shorts (pockets to carry my phone and schedule) and tank tops or short sleeved shirts all three days, and the only downside was the unrelenting sun, which left me sunburned even after religious sunscreen application. I didn’t have to use cash once, thanks to Cashless (activate this at home, if you can, since you won’t want to wait in line doing this at Zilker). Fine & Folded hooked us up with fans, and I used mine a lot when the breeze died down and it fit nicely into my small backpack and even my back shorts pocket and was easier to carry around than the free fans I saw many festgoers using. Although we didn’t address transportation and parking in our articles, since the options are clearly laid out on the ACL website, I will say that the easiest way to get back and forth is to see if you can find someone to drop you off and pick you up (as long as you aren’t leaving right when the festival ends and the official drop off/pick up area at Austin High is mobbed). 11:15am (Tito’s Stage) – The hippest group of crooning kids around, the Barton Hills Choir, will be including Foo Fighters songs in their set at this year’s festival. Enjoy the shade at the Tito’s stage while you listen to these rock stars-in-training perform. Check out our profile of the Choir from a few years back with an interview from three of the members. Note: Tameca Jones on the Austin Ventures stage is a close second, although I would pass, since I can see her locally and I’m less likely to see the Choir. 12:15pm (Samsung) – Meg Myers has a rich and powerful voice which melds seamlessly with a guitar-synth backdrop. Listen to her debut album, Sorry, here and you’ll understand why she has drawn comparisons to Fiona Apple, Sinéad O’Connor and Alanis Morrisette. I saw her Weekend Two and was impressed that such a such strong vocals came from such a tiny human. 1:00pm (Miller Lite) – The big sounds of Brit guitar rock group The Maccabees are perfectly suited to an outdoor music festival. “Marks to Prove It” gives you a taste of what the band will be bringing to the Great Lawn. I caught their set and was buoyed by an enthusiastic crowd and the band’s stage presence. 2:00pm (Honda) – At last year’s ACL Fest, we heard from one of the members of the pop group, Fun: Jack Antonoff. This year’s festival brings us Nate Ruess, fresh off the recent release of his debut solo album, Grand Romantic, which deals with love, commitment and his burgeoning romance with fashion designer Charlotte Ronson. 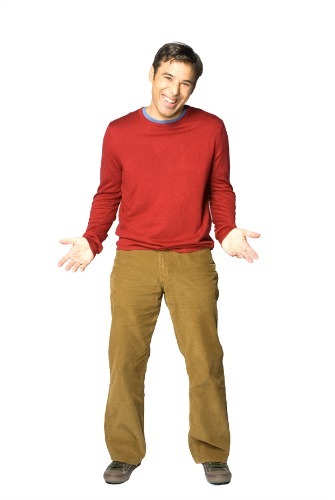 You’ll recognize his voice in “Great Big Storm”. This was a fun set during Weekend One, although some festgoers commented that the set was too heavy on Fun songs. I heard great things about Royal Blood, who play the Samsung stage in the same time slot. 3:00pm – Nothing stood out for me personally during this time slot. I’d probably use this time to grab some linner, since the lines at ACL Eats can get longer during the more standard eating hours. 4:00pm (Honda) – Twenty-six-year-old gospel and soul singer Leon Bridges has been everywhere lately, most recently performing a Tiny Desk Concern on NPR. His soothing, throwback sound will be the perfect segueway to the evening performers. I found his set to be captivating, as did all of the people around me in the crowd. I couldn’t resist the temptation to also see Billy Idol across the park at Samsung, and, although he had a few false starts during “Rebel Yell”, he laid out nostalgic hit after hit for the last part of his set. 5:00pm (Austin Ventures) – Nashville rock group Moon Taxi played Lollapalooza this summer on their way to Austin to play ACL. By all accounts their song has only grown as the band has matured. Billboard premiered “Year Zero”, the lead single off the band’s latest album, Daybreaker, here. 6:00pm (BMI) – I know a lot of fans of Tame Impala, and I caught part of their set during Weekend One, but I’d recommend taking a break from the bigger, more crowded stages and checking out DeRobert & The Half-Truths and their raw soul. Check out our profile of the band here. 7:00pm (Austin Ventures) – Although it’s very tempting to see Austinite Gary Clark, Jr. perform on the Samsung stage, ACL is a great chance to see George Ezra, a UK-based star on the rise at the ripe old age of 21. I’m not sure who likes to sing along to “Budapest” more, me or my 9-year-old. 8:00pm (Samsung) – I’ve never seen the Foo Fighters live, so I’m excited about the chance to see the band perform. You might remember that the Foo Fighters included Austin in their cross-country HBO documentary series, “Sonic Highways”, which included the band performing “What Did I Do? God As My Witness” with Gary Clark, Jr. I might check out Disclosure across the park on the way out of the park. 11:45am (Austin Ventures) – We can’t think of a better way to start out the second day of ACL than with the upbeat vibe of local duo Riders Against the Storm. We were sad that the band wasn’t able to perform last year, because of the weather, but we still think you should read the profile we ran of Chaka and Qi Dada. 12:30pm (Austin Ventures) – Stick around for Bee Caves, one of our Weekend Two Must-See Bands. The five-piece’s alternative, post-Americana, psychedelic rock is perfect for ACL. Read our profile of the band here. 2:00pm (HomeAway) – Ryn Weaver got a ton of attention during SXSW, where she rode a tide of Internet buzz along with the release of “OctaHate”, which she wrote with Charli XCX. Billboard put out an interesting story about Weaver’s rise here. Weaver was probably my favorite act of all Saturday during Weekend One because of her honest delivery, her powerful vocals and her ability to engage the crowd. 2:30pm (BMI) – Nashville duo Sugar + The Hi-Lows’ sultry garage rockabilly and Motown-laced pop will be the perfect thing to get you through your mid-afternoon and the BMI stage is a nice, semi-shady spot to take a break from the main stages. 3:30pm (Austin Ventures) – Since we can catch Shakey Graves around Austin, our pick for this timeslot is Houndmouth. I have yet to get tired of hearing “Sedona”, despite the fact that the song is on regular rotation on the radio. MisterWives is another band that had a big draw during this timeslot. 4:30pm (Samsung) – Columbus-based duo Twenty One Pilots is not only one of our Weekend One picks, but also in Red Bull’s Must-See Artist list. I didn’t really know what to expect, since I wasn’t very familiar with the band’s music, but I got caught up in the crowd’s energy while watching the band hold the attention of a large audience. The song I did know, “Tear in My Heart”, was much more pop-infused than the other songs in their set, which had a decidedly hip-hop flavor. 5:20pm (Miller Lite) – I put Unknown Mortal Orchestra on my list because I like psych-soul ballads like “Multi-Love”, but in truth, during Weekend One, I ended up with friends at Walk the Moon, despite having seen the Midwestern band several times. I was glad we ended up there, since it was one of the highlights of my Saturday, and the vibe from the band and the crowd were infectious. 7:00pm (Honda) – In late March, Modest Mouse released its first album in eight years to its legion of fans. Weekend One fans didn’t have a chance to see the band play, as Alabama Shakes were in this timeslot. 7:20pm (Miller Lite) – TV on the Radio has been around the block, having performed together for over 10 years. The band played a rousing set during Weekend One and is poised to do the same this weekend. 8:20pm (Honda) – deadmau5‘s ACL performance will feature The Dome, a geodesic structure which will be the hub of the EDM artist’s set. Honestly, I didn’t make it through the entire set, and if I had to do it over again, I might spend some time at Drake as well before heading home to rest up for the final day. 12:30pm (Austin Ventures) – The Hunts played last year’s festival at the BMI stage and electrified the crowd (me included) with their melodies and how their vocals and instruments all meld together seamlessly. The alt-folk harmonies should perhaps come as no surprise, since the band is made up of seven – yes, seven – siblings. 1:30pm (Austin Ventures) – Stick around for Kaleo, the band which moved from Iceland to Austin last year, just in time for SXSW. Truth be told, the band is very easy on the eyes, but they have the musical chops to back it up. 2:30pm (Honda) – It’s true that Michigan-born BØRNS‘ blend of folk, glam and rock sound out of this world. Even Taylor Swift agrees. She called Garrett Borns’ new single, “Electric Love”, an “instant classic”. I like Sheppard as well, but the entire set from Borns was worth staying for. 4:00pm (Miller Lite) – Sylvan Esso combines the stunning vocals of Amelia Meath with a soundtrack masterminded by electronic producer Nick Sanborn. I was wondering how the band’s sound would work at a large outdoor festival, but it did. 4:30pm (Honda) – The Decemberists Late Night Show was praised by many, and the band’s staying power is well-deserved. I skipped the band’s set the first weekend to see The Suffers, who aren’t playing Weekend Two. 5:30pm (HomeAway) – I have yet to find a song by Australian pop sensation Vance Joy that I haven’t liked. His latest which I already know all the words to is “Fire and the Flood”. I thought the set the first weekend got off to a slow start, but the second part was solid. 6:30pm (Samsung) – Another Icelandic export, Of Monsters and Men, captivated the Weekend One crowd with a sprinkling of hits among lesser-known tracks. 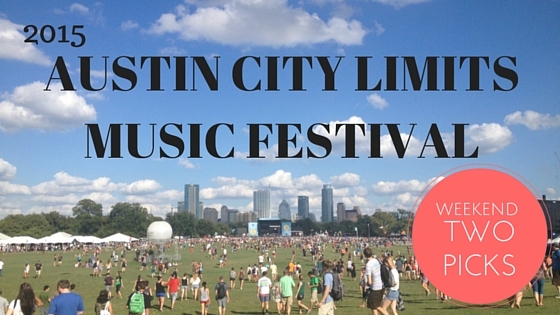 7:30pm (HomeAway) – ACL fans were heartbroken when Hozier had to cancel his 2014 performance. The wait is nearly over to hear this revered Irish singer-songwriter. This might have been my favorite performance of all of Weekend One. The spillover from the stage showed that the crooner could stand on his own on one of the main stages. 8:30pm (Samsung) – The only reason I’d consider going back to ACL a second weekend would be to see Florence + The Machine. Save up your energy so you can make it through this final performance of the festival. Who is on your list for Weekend Two? Weekend One festgoers, which bands were your favorite?